PERMATRAN-C Model 4/41 is a carbon dioxide (CO2) transmission rate test system for assessing barrier films and package materials. The PERMATRAN-C Model 4/41 is ideally suited for rapidly predicting product shelf-life, or checking the quality of incoming and outgoing packaging materials. These results aid in structure development and prevent costly over packaging. The PERMATRAN-C Model 4/41's perform tests directly at "real world" temperature and CO2 levels. The system's transmission rate software will control up to 20 test cells in a system. In addition, the software reduces the possibility of errors with its ability to automatically determine equilibrium and compensate for any flow changes. Pre-programmed test formats, computer and menu-driven screens make it easy to generate and interpret data test data. The cell is plumbed as a remote cell to the Permatran-C 4/41. The top portion of a soda bottle to about ½ inch below the bottle cap, with the cap in place with proper torque is then installed into the Cell. Two o-rings seal against the inside diameter of the bottle neck to separate the pressurized carbon dioxide (inside the bottle) from the Nitrogen carrier gas (outside the bottle). A Nitrogen flush zone has been created between the two o-rings so that any carbon dioxide that permeates past the first o-ring will get flushed out of the cell before it contaminates the second o-ring. Once the bottle cap assembly is put into proper position, two retainer clips, held in by shoulder bolts, slide between the cap and the filler ring. This holds the assembly in place even when the cap assembly is under high pressures. There is a safety feature built in so that you cannot pressurize the underside of the cap assembly unless the cover is on. 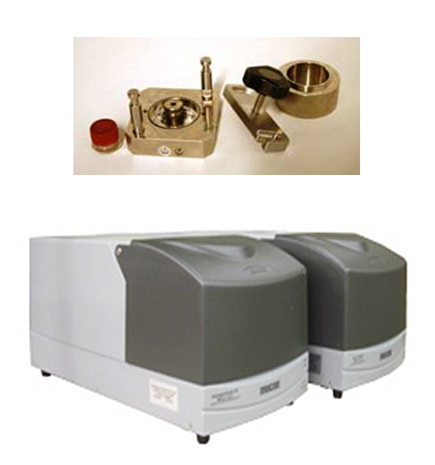 Carbon Dioxide permeation rate measurement system for films and packages.